Videos and sounds on your web pages can make them more interesting and informative. 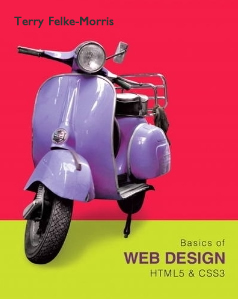 This chapter introduces you to working with multimedia and interactive elements on web pages. Methods to add audio, video, and Flash to your web pages are introduced. Sources of these media types, the HTML code needed to place the media on a web page, and suggested uses of the media are discussed. You'll also create an interactive image gallery with CSS and explore new CSS3 properties. Adding the right touch of multimedia and interactivity to a web page can make it engaging and compelling for your visitors. Resource websites and chapter links are listed below. As indicated in Chapter 1, HTML5 is now in Recommendation status. 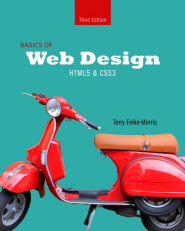 However, it is good practice to code a fallback for the HTML5 Video and Audio elements to provide support for older browsers. "An example of a web page with a vertical fly-out menu is available in the student files (chapter11/11.9/vertical)." The text in the gallery area should be left-aligned. The author would like to hear from you! Feel free to complete the contact form with your questions or comments. Review activities are available for this chapter. Check your knowledge of chapter terms and concepts.